In the cool Molokai uplands, a pack of mules prepare for the day's ride down to the worlds most unique and formerly forbidden village of Kalaupapa. The journey begins from the Mule Barn with a mule guide briefing. 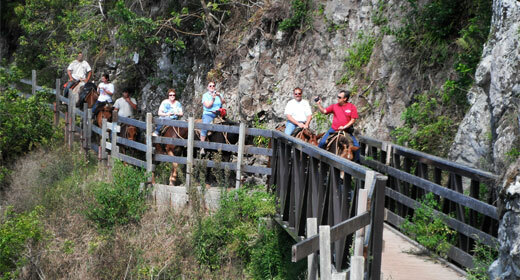 You'll learn your mule's name and the Mule Skinners (guides) will teach you how to ride and control the mules. No worries, these mules are personally trained by company owner Buzzy Sproat. Well known in the Hawaii Rodeo circuit, Buzzy is also considered one of Hawaii's foremost experts on Mules. Kalaupapa, is truly a special place in Hawaii, and like no other you will ever experience. The Kalaupapa National Historical Park & Guided Mule Tour is one that even seasoned travelers cherish, as one of their most memorable Hawaii experiences. If you're planning a trip to the islands soon, don't miss this opportunity of a lifetime. Book your adventure today. Bottled water if you are hiking. Something to read if you are flying. Waiting time may occur either before and/or after the Damien Tour depending on number of flyers and/or weather. Once in Kalaupapa, Damien Tours or Kekaula picks up hikers, mule riders and folks that fly in, for a trip back in time and place as you explore the Kalaupapa Penninsula. The bus picks you up from your arrival point in Kalaupapa (the airport for folks that fly in and the foot of the trail for mule riders and hikers) and takes you through the new settlement with stops at St Frances Church, Mother Marianne's gravesite, and the visitor center. The tour takes you to the old settlement that Father Damien founded. Here you will visit St. Philomena's church, which Father Damien built. Father Damien's gravesite is next to the church. Visitors can also walk to Siloama protestant church, the first church to be built in Kalawao. Enjoy your lunch and soak in the beauty of the North Shore of Molokai. Return to airport or trail depending on how you plan to leave. See our Kalaupapa Activity Pricelist for a complete list of alternatives and tour prices for visiting Kalaupapa.